Install Panels 3" above curb. 12" curb - 200 to 600 lbs. 14" curb - 600 to 1000 lbs. 16" curb - 1000 up lbs. Freudenthal Self Locking Panel has become of interest to many of today's Dairy Farmers. The Panels have been designed to hold animals to make health checks, breeding, and vaccination a much easier task. The Dairy Farmer has the option for the animals to self lock themselves or if it is not desired, free access is also available. 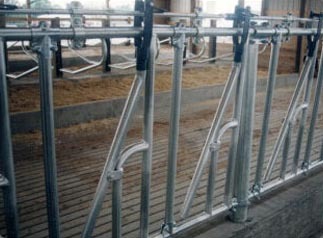 When the cows or young stock are finished eating, one simple lever releases the entire row. If you wish to hold one, two, or any amount of animals, simply flip lever above each animal and release the rest with one turn of the lever. Panels can be spliced together to reach almost any length. Freudenthal pays close attention to detail when designing equipment, as in our Self Locking Panels. Not only is the Panel constructed of the highest quality tubing available, our pivot pipes come standard with inserted case hardened bushing and grade 8 bolts. Our top control is completely solid and each neck opening is adjustable. These are the heaviest and strongest Panels on the market, weighing 235 lbs per 10' section. A standard Panel for animals nine months of age and older would be 10' long with five or six openings x 40" high.